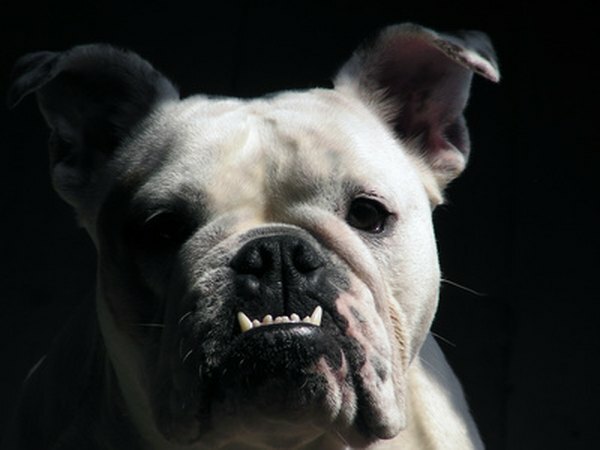 A bulldog's wrinkles require daily cleansing to avoid skin infections. A bulldog's wrinkles are what makes it unique -- and also creates the need for daily care of his skin. Without daily cleanings of these wrinkles, a bacteria build-up can cause fold dermatitis or yeast infections caused by a moist, warm environment that is not receiving enough airflow. Wet a washcloth with warm water and gently clean your English bulldog's wrinkles, pushing each fold out of the way to remove dirt, oil or sweat in each crease. Gently rub his nose clean, as well. A mild dog shampoo can be used, if desired, but is not necessary on a daily basis. If shampoo is used, however, follow that with a rubbing of a rinsed washcloth to remove soap residue. Baby wipes with aloe and lanolin can be used in place of a washcloth. Follow cleaning with a gentle towel-drying to remove excess moisture from the wrinkles. A small dusting of cornstarch can be rubbed into the creases to absorb sweat. English bulldogs do not need frequent baths; when daily face-cleaning and brushing is being done, bathe him only as necessary. Once he is soaped down in the bath, allow the shampoo to sit for a few minutes on his body as you clean his wrinkles. Wet a washcloth and put a small amount of mild dog shampoo on it. Rub this over the dog's face, moving the folds to get inside the creases and remove dirt. Wash the wrinkles on his forehead, under his eyes, above and around his nose. Rinse the washcloth thoroughly and remove all shampoo residue from his face before rinsing the body until no soap remains. Warm water can be run over his face if he doesn't mind it; hold the flaps open to allow the clean water to flush out any shampoo residue. Towel dry the dog and all wrinkle creases, and then add a brushing of cornstarch in his wrinkles to protect the skin. English bulldogs will get "tear stains" in their wrinkles from fluid draining down their face. Commercial cleaners and stain removers are available for purchase at pet stores. Or homemade versions -- such as one tablespoon hydrogen peroxide mixed with corn starch until it is a thin paste -- can be applied to the stain. The paste should be allowed to dry before brushing off the excess powder. Put this on every day until the stain disappears, and then once a week to keep it from reappearing. For an easier stain remover, use a diaper cream, such as Desitin, to rub into the stain. Avoid getting any of the stain removers near or in your English bulldog's eyes. 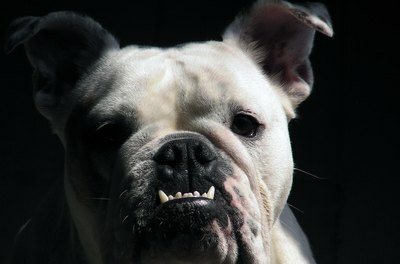 Use a Q-tip to apply soothing ointments to the English bulldog's wrinkles if they appear irritated or infected. Petroleum jelly, such as Vaseline, can be used on minor irritations or redness. For irritations requiring medication, use Panalog Ointment, Bag Balm or an anti-yeast cream. Remember to avoid getting any creams near or in his eyes. Allow these to remain on the skin until his next day's facial cleansing. Which Dogs Have Wrinkled Faces?